We can check out the 121 cafe next time you are in the area. Just send me a message. It's a nice place. 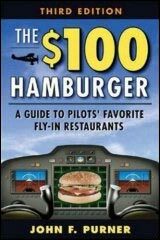 I fly to The Hangar at KSPG (Albert Whitted, St. Pete, Florida) frequently for $100 hamburgers. They also have some simply amazing fried chicken and waffles...if you're ever in the neighborhood you need to try it. I haven't had a burger there but I can attest to the crab cakes at The Airport Tiki. Worth flying in!